North east view of the parish church of Saint Mary and Saint Nicholas in Spalding, Lincolnshire. 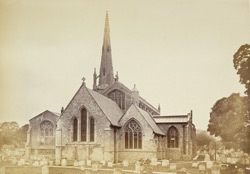 The vast nave rises in the centre "with its clere-story and embattled parapet in perspective, and its unusual five-light and traceried east window, and the gable surmounted by the sancte-bell cot, and flanked at the north-east angle by the octagon stone capped rood-stair turret. On the north side is the transept...The newly added Chapel or chancel aisle with its flamboyant four-light Decorated east window contrasting strongly with the Early English triplet window of the chancel east end which has been (1866) re-built from the string-course below the window sill. This gable and roof have been recently restored to their original pitch. On the south side, but not adjoining the chancel, stands the Chapel of S. Thomas...In the rear and above all the numerous roofs and gables rises majestically the grand old spire completing the pyramidical form of the group."